It’s officially been a week since we moved, but we spent much longer than that with our kitchen in boxes. Ordinarily, that would have meant takeout. 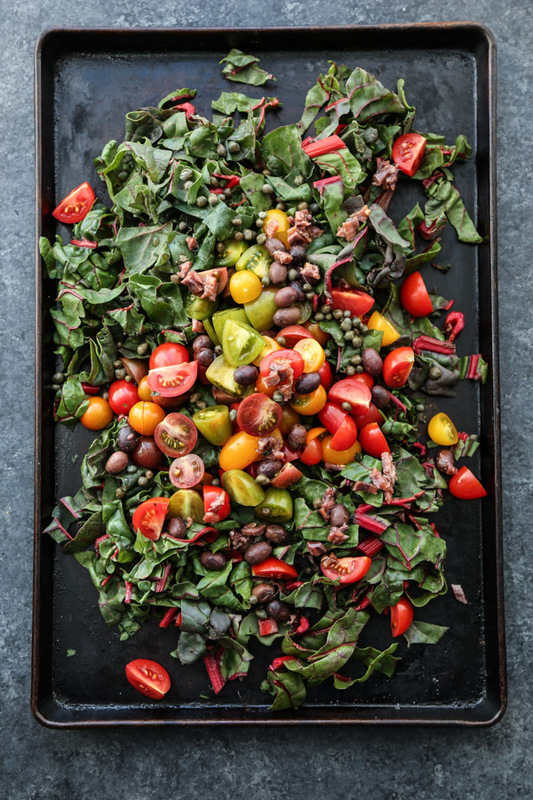 But since my low FODMAP diet makes that tricky, instead it meant sheet pan dinners. We left only a few things out and at the ready: a spatula, the tea kettle, and this sheet pan, which became the vehicle for all our final countdown meals. Packing up all the other items in the kitchen was at the top of my stress list. But I knew it wouldn’t be nearly as anxiety producing as cleaning out the fridge and transporting all of the half-eaten jars by ourselves. In preparation for this grand finale, I made a concerted effort to buy as little produce as possible, use it start to finish, and plow through some of those random jars in our sheet pan meals. Because we are crazy green hoarders these days, we ended up taking most of the cleaned jars with us anyway. But at least they were empty! 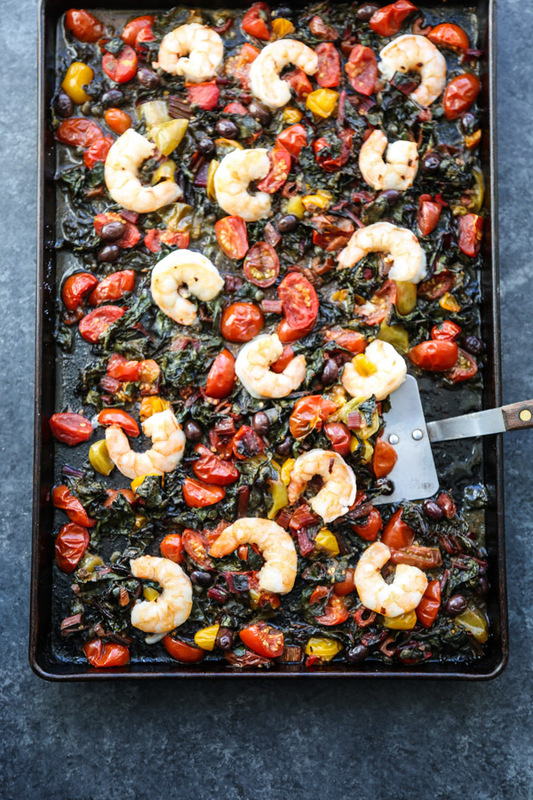 My favorite triumph of this pantry purge cooking experiment was the sheet pan shrimp recipe that’s gracing your screens today, topped with a rustic cherry tomato puttanesca sauce. If you’ve read my updated advice on cooking for low FODMAP diets, you’ll know that utilizing the antipasti bar is one of my big strategies for getting around the garlic and onion omission while still packing tons of authentic Italian flavor into my dishes. It also just so happens to be my central strategy for reducing the jars in my fridge and pantry, since capers, olives, and anchovies, tend to take up a lot of real estate there. 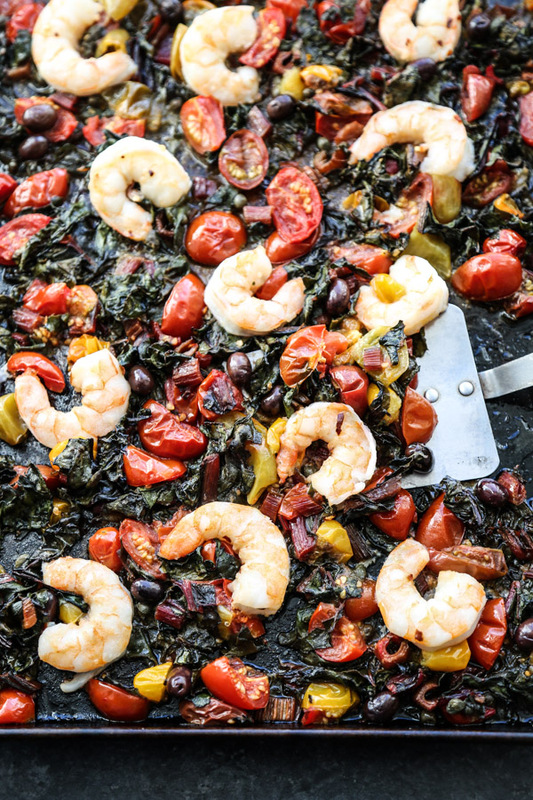 To make the dish more of a complete meal, if less of an actual pasta sauce situation, I tossed a whole bunch of red chard in with the tomatoes and topped the mixture with jumbo wild shrimp. 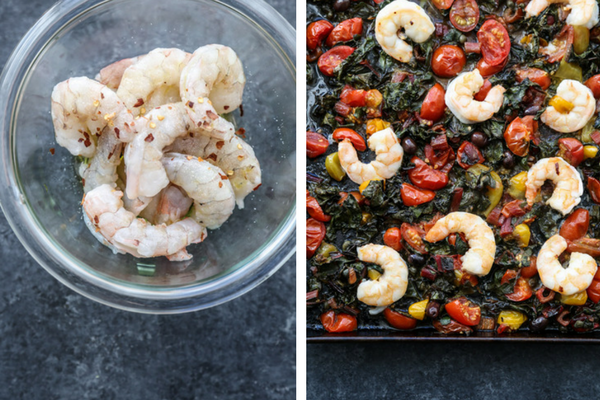 When you’re making sheet pan meals with seafood, you have to be careful about cook time and either pair it with vegetables that don’t take more than 10 minutes in the oven, or give them a little bit of time to prebake before adding the protein. This week I’m in major recovery mode. I’m letting my body relax again, I’m getting back into the swing of cooking in a new (highly organized!) kitchen, and I’m exploring some of the local yoga and pilates spots so I can create a new routine going forward. Fort Greene peeps, recommendations welcome! 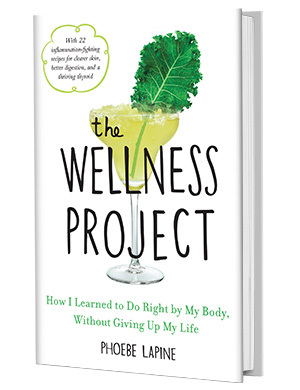 As for the rest of you, I’m going to be talking about SIBO on Facebook LIVE later today (5pm) with Dr. Will Cole! Bring your questions about all things intestines (woot!) 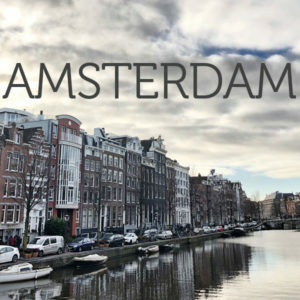 and find out more about how a low FODMAP diet works from a medical perspective! 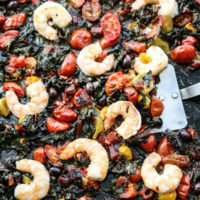 This recipe turns my favorite roasted puttanesca sauce into a complete meal with loads of green chard and spicy shrimp. 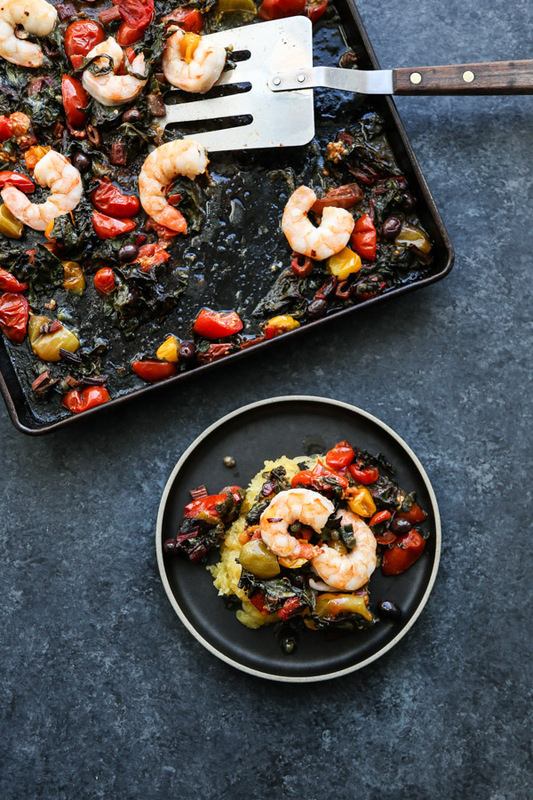 It’s such an easy sheet pan dinner, and easily adaptable for low FODMAP diets. 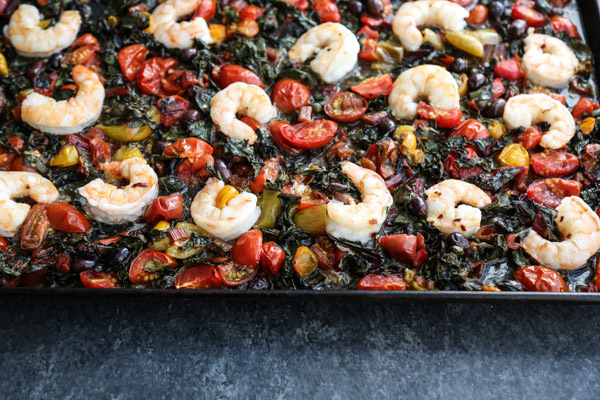 On a large rimmed baking sheet, toss the chard, tomatoes, shallot, garlic, olives, anchovies, capers, 1/4 cup olive oil and 1/2 teaspoon of salt until combined. 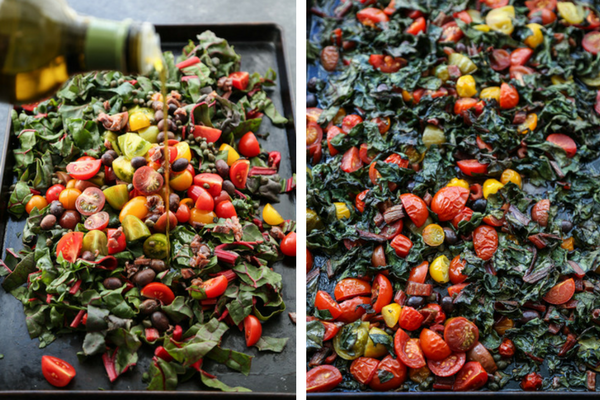 Arrange in an even layer and roast in the oven until the tomatoes are softened and the chard is entirely wilted, about 20 minutes. Remove the pan from the oven, give the tomatoes a stir and arrange again in an even layer. In a medium mixing bowl, toss the shrimp with 1/4 teaspoon of salt, 2 tablespoons of olive oil, the lemon juice and the red pepper flakes. Nestle the seasoned shrimp into the tomato mixture. Return to the oven for 10 more minutes, until the shrimp is light pink and curled. 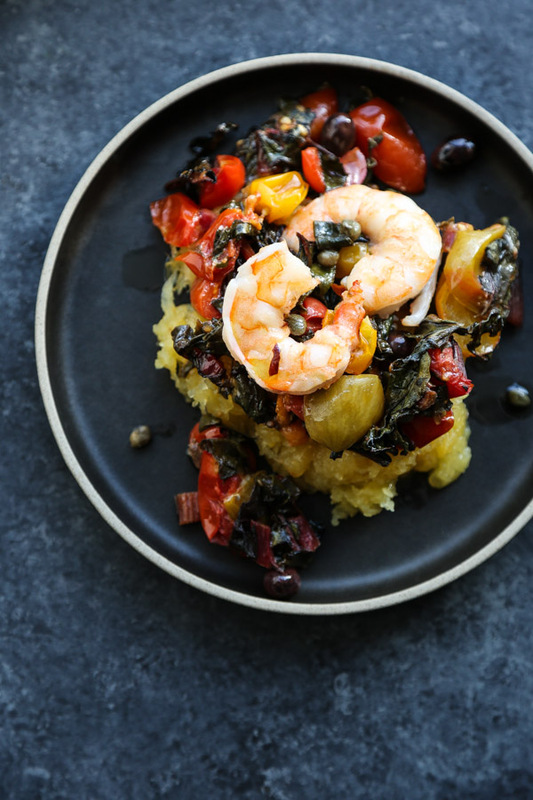 Serve warm over gluten-free pasta or spaghetti squash. To make this low FODMAP, simply omit the garlic and shallot. I've had it this way, and it remains delicious! Sounds so yum! Do you have any recommendations for using frozen shrimp? If that would even be possible with this recipe? I always defrost my shrimp before cooking it. Just rinse or soak in warm water until defrosted or keep on the counter for a few hours. 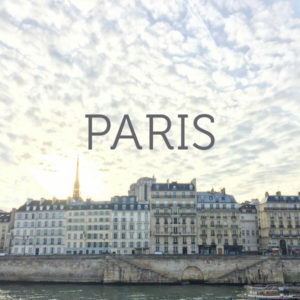 Then roast away!